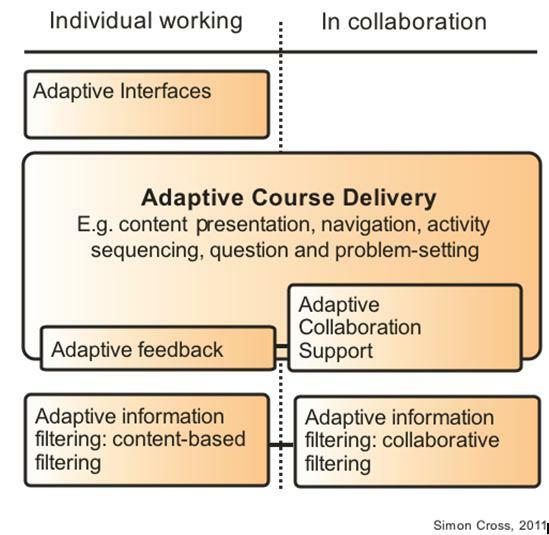 Of course, designing adaptation requires a departure from the linear, single path a learner is taken through a course, be this across a lecture series, a distance learning guide or a series of online learning tasks. Reigleuth makes the point that ‘one size does not fit all’ and indeed, in 1999, the materials for the OU’s own course on Teaching in Higher Education stressed how students learn differently and proposed as good teaching practice that the teacher understand and respect their student needs, approaches to learning, stage of learning development, interests, motivations, backgrounds, prior knowledge, etc. Doing this, it was explained, will allow teachers to best adapt the learning experience to their students including planning for their support needs. According to Moreno-Ger et al. (2009) explain that ‘adaptation is a wide and rich field [which has evolved] from the early 1980s where computer-based training was used to fully control the flow of a learning process.’ Adaptive systems provide an alternative to the ‘traditional just-put-it-on-the-web’ or ‘one size fits all’ approach to the development of Wed-based education courseware. Put simply, they suggest, ‘adaptation is the ability to modify lessons using different parameters and a set of predefined rules, in order to try to cater for the needs of all kind of learners and thus maximise the effectiveness of the learning experience. Perhaps unsurprisingly, terms such as ‘adapting’ and ‘student needs’ feature prominently and advocates are united by a desire to enhance the student learning experience. I have created working definitions of adaptation, customisation and personalisation (see end of post). Adaptive systems can be categorised into a number of types. The following table, whilst not intended as a definitive representation, summaries these. The main focus of the report was adaptive course delivery and teaching and, although haven’t the space to go in to detail here, the full report looks more closely at aspects of this (navigation, presentation, assessment, sequencing, feedback etc. ), gathers a couple of exemplars of institutional examples and begin the task of reflecting on the issues of implementation within a teaching institution. Looking back to when I started this project, I was surprised that there was already some, albeit limited, functionality within Moodle to build adaptation in to the online study planner (a tool that students are encouraged to use and which takes up a prominent position on their student home page). Simone and I have taken the opportunity presented by this project to think about how to develop the Moodle functionality further. One obvious omission in the adaptive arsenal is a ‘decision’ plug-in – something that presents a choice to the learner and which can trigger adaptation of content, navigation, links, sequences etc. within that week of learning or later in the course. We have so far completed a specification and development work has begun, and hope that resourcing can be found to complete this. At present the full report is only avialable to OU staff, however, I hope to rework this for wider dissemination shortly. Adaptation is broadly taken to refer to any change to a unit of learning or teaching made with the intention of enhancing the learning experience whilst the module is in presentation and in response, either directly or indirectly, to student activity seen, witnessed, recorded or logged whilst they were taking the module. Presenting students with choices, developing decision-making logics and conditionality, or responding to learner behavior are examples of adaptation. Given the very nature how adaptation works, there will always be more than one potential route through an adaptive learning element. Customisation is taken to refer to change made to a unit of learning or teaching with the intention of enhancing the learning experience before the learner starts studying it. These changes are made in response to specified criteria and may represent a deviation in some way from an existing original module design. The resulting module may be no more adaptive or interactive than the original one (i.e. it may be just as linear). Personalisation is defined in respect to student perception. For personalisation to have taken place, an individual student must perceive that the learning and teaching has been made more appropriate to their personal needs – that it has been made ‘more personal’ (whether they acknowledged those needs in advance or not). Adaptation and customisation are methods by which we can seek to make a module more personal. It’s possible that the Moodle functionality will be available shortly through next generation, personal learning platforms that work inside any LMS including Moodle. Adapt Courseware is building courses with optimal choice built in along with motivational support in a rich multimedia experience for the student.